This is an a magical trip to the gorgeous Cotswolds in England July 23 – August 3, 2018. I hope you can join us for 10 glorious nights in the Queen Anne Manor home not far from Chipping Campden. We will paint, draw, write, travel, dine, laugh and have a great time. We will tour gardens and learn about the Arts & Crafts movement which originated there in the Cotswolds. Landscape Architect, Curtis Stewart, will teach us about English Garden Design and Rachael McCampbell will talk on the Arts and Crafts Movement, taking the group to see examples of the work. 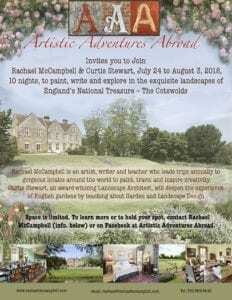 We will do journal painting, see Highclere castle, many of the ancient Cotswolds villages, Blenheim Palace, Roman ruins, have high tea, dine in pubs, hike the English countryside and more. I hope you can join us!